Sie sind hier: Home » Postkarten - Postcards » Diver in a German "N..
original Titel: "Diver in a German "Neufeldt-Kuhnke" diving suit made in 1923." 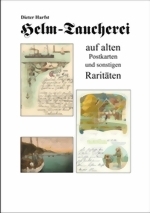 Datum / ÄRA: Postkarte/Fotographie, veröffentlicht um 1923. Photograph depicting a diver entering an early diving suit. 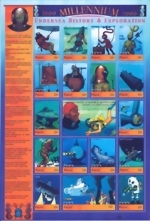 During early experimentation, Royal Naval divers tried many different methods to find the most effective way of sustaining underwater activities. This cumbersome, science fiction-looking contraption is a German diving suit. This suit was used in the early twentieth century to work in deep waters. The shell could resist pressure up to a depth of 160 meters and had a telephone which would enable the diver to stay in contact with the surface. 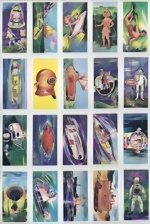 It also had grips serving as hands that enabled the diver to undertake many tricky underwater tasks. However, although the suits could descend to great depths, the pressure there would crush the coupling joints, making movement impossible. Further improvements in diving equipment made this model obsolete. 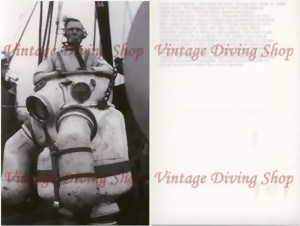 original titles: "Diver in a German "Neufeldt-Kuhnke" diving suit made in 1923."